The only photo I managed to take! The kite is just in front of Ebi-kun! 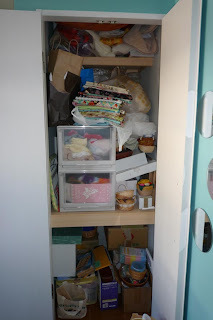 When we got home I decided to sort out the spare room cupboard having my stash in draws just isn't working and not having shelves in the cupboards makes for many an avalanche disaster, as you can see AND I had actually taken a couple of bags of stuff out before I took the photo! I have got the shelves in and my stash nicely folded and put away, just got to figure out how to get everything else back in the cupboard. The top of the two draws is filled with clothes that I just can't part with - I think this exercise might just make me do it though, the bottom draw is general crafty 'stuff' and all the gubbins in the bottom of the cupboard is Montessori/teacher related and is going to need some major sorting out. I will post pics when I manage to get it all sorted. This is an in-progress shot, how am I going to get that lot back in the cupboard? What a carefree day! Kite flying really sets your soul free! 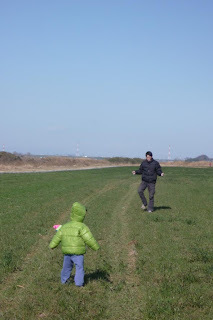 The kite flying looks like more fun than the cupboard, even if the kite never really got airborne! LOL. I am sure it would have been more carefree if we had got the thing in the air - maybe we should read the manual! You should see my craft rooms!